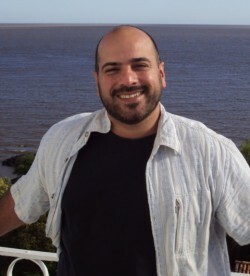 Illinois State University’s Assistant Professor of Molecular Neuroethology Andrés Vidal-Gadea has been awarded a National Science Foundation (NSF) grant of $638,000 to study how animals detect the magnetic field of the earth. 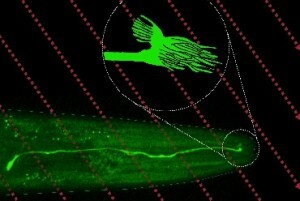 Andres Vidal-Gadea’s team discovered the first sensor of the Earth’s magnetic field in animals in the brain of a worm. Vidal-Gadea’s team will continue to work on his discovery of magnetic beads or pearls near magnetic neurons. “Just like an oyster makes a pearl, some organisms can make magnetic pearls. In magnetic bacteria, these pearls align to form the shape of a needle, moving just like a needle in a compass.” The grant will help fund the study of genes in the worm in the hope of identifying the ones that are important for the creation and function of the pearls. While labs around the world are working on the tie between magnetism and migration, Vidal-Gadea’s lab pioneers this work in the nematode C. elegans. “Figuring it out is one of the holy grails of sensory and neuroscience. And it’s fun,” he said.